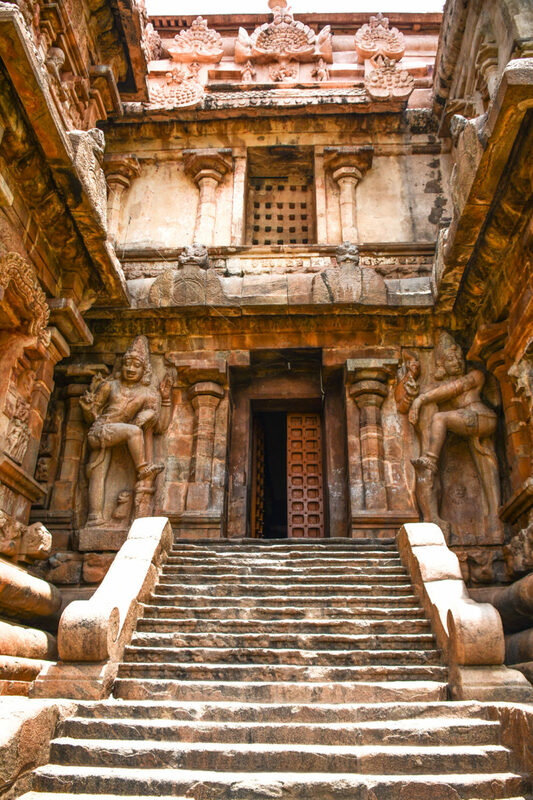 Having been fascinated with the Chola dynasty ever since I read Kalki’s epic, Ponniyinselvan, a historical fiction about Emperor Raja Raja Chola before he ascended the throne, I wanted to visit the Big temple or Brihadeeswara temple of Tanjore,India, constructed by him 1000 years back. (actually it completed the 1000 years of its construction in 2010). This summer while visiting my family in Pondicherry, India, I decided to visit the beautiful Temple of Tanjore which was about 100 miles south of Pondicherry. 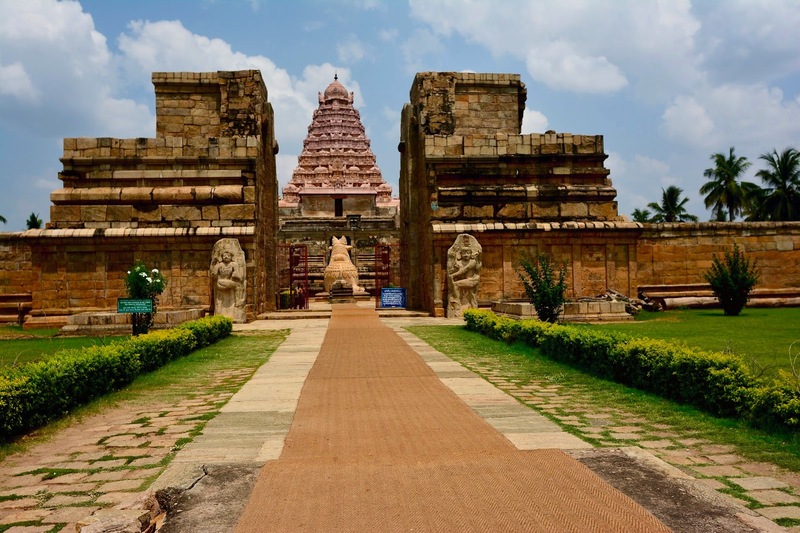 As I was making plans I added Gangaikondacholapuram temple and Airawateeswarar Temple in Darasuram to my itinerary at the insistence of my hubby as these 3 temples make up the UNESCO listing of Great Living Chola Temples. These 3 temples lie about 50 miles roughly apart and my sister-in-law managed to book a taxi for me to visit all 3 temples in a day. Next day I left early in the morning and after about 2 1/2 hours I reached Gangaikondacholapuram, the temple nearest from Pondicherry. I told the driver to park under a tree and go have a cup of tea while I stepped in to see one of the iconic monuments of history. Gangaikondacholapuram, the temple was built by Emperor Rajendra I the son of Rajaraja Chola to celebrate his victory in the plains of Ganges, hence the name, Gangai-Konda-Cholan-Puram. Emperor Rajendra I had fought many battles, conquered many lands all the way to Indonesia covering some 14 modern countries. Emperor Rajendra asserted power over Chera, Pandhya, Vanavasi , Chalukya kingdoms, he attacked and defeated the Sailendra king Sangramvijayottungavarman (Java- Sumatra). He also conquered Burma, Sri Lanka, Maldives, Lakshwadeep, parts of Malaya and Islands in the Eastern Archipelago . He was a great patron of arts and follower of Shiva. After defeating the Pala king Mahipala, he saw the mighty Ganges that flowed from the matted hair of Lord Siva that he had only heard of before; he immediately wanted to take some of this mighty river to his capital in south. So he first established his capital in Gangaikondacholapuram and proceeded to build a temple there and a huge water reservoir in Ponneri nearby. Then he had the water of River Ganges transported to his capital and filled the Ponneri reservoir with the water from Ganges. He also had a well built inside the temple of Gangaikonda Cholapuram into which the water from River Ganges would drain, so that the deities inside the temple would be bathed with the water from holy Ganges forever. As I walked in towards the temple I came upon the huge Nandi sculpture at the entrance of the Temple. I paid my obeisance and then proceeded towards the main temple. Immediately I was greeted by the towering, magnificent nine storied Vimana (temple structure), reaching a height of 185 feet. The temple,a replica of the big Temple in Tanjore, is built in a typical Dravidian architecture and one can see small influences of North India in the intricate carvings, most probably due to his travel to North India as part of his conquests. 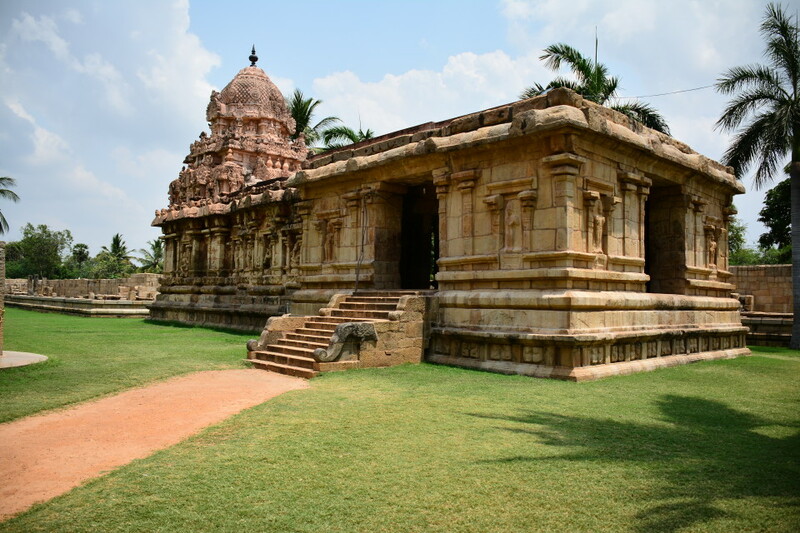 This temple is also known as the female version of the Tanjore big Temple due its shorter structure and being less angular than the Tanjore big temple. I walked into the main temple and immediately saw the huge Dwarapalas at the entrance and then at the entrance I saw the beautiful and intricately carved sculpture of Goddess Saraswati sitting serenely on a lotus, I proceed further into the main sanctum sanctorum I see the 4 meter high Lingam. I offer my prayers and walk outside. The main temple is flanked by smaller temples on both sides. A temple of Devi Durga (Mahishasuramardini) is on the northern side and a temple for Chandikeswarar on the Southern side. 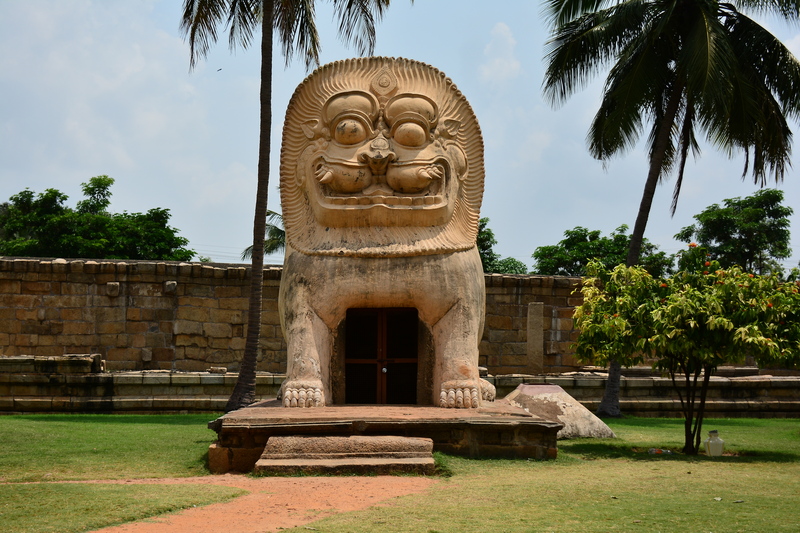 The Simha-kinar (Lion well), the well into which water from the river Ganges was poured into is on the North-Eastern side of the temple next to the Devi Temple, a huge Lion stands guarding this well. It is said there was a secret passageway that linked the Emperor’s palace in Ulkottai near Gangaikondacholapuram to the northern part of the temple. The temple has many spectacular carvings and sculptures that speaks volumes about the artisans who poured their hearts and souls into building this Temple. 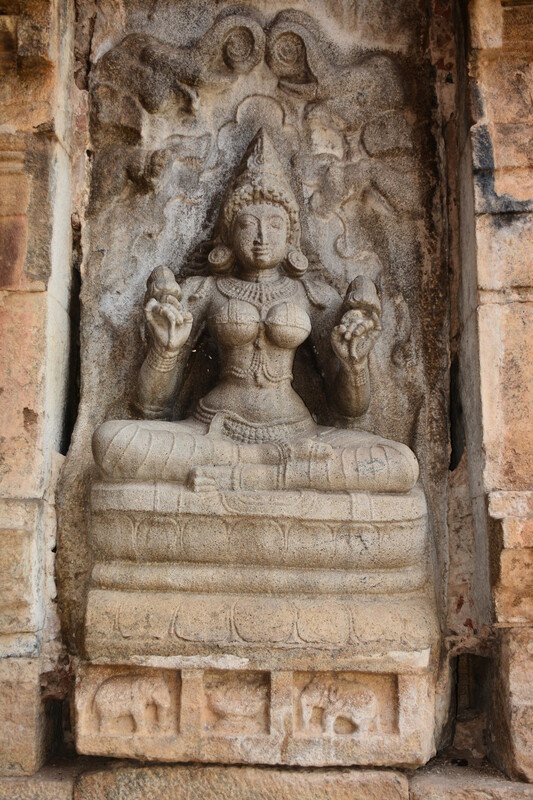 The many carvings on the main Temple consists of Goddess Lakshmi, Goddess Saraswati, a beautiful carving of the dancing Shiva (Nataraja) , Shiva – Parvati in the form of Ardhanareswara , another uniquely different carving of dancing Ganesha , a panel of Lord Brahma with his consorts Savitri and Saraswati .The exterior walls of the Temple has exquisite carvings of various forms of Lord Siva, namely Vishnuanugraha murti, Ravananugraha murti, Devianugraha murti, Kalyana Sundara murti, Markandeyanugraha murti, Chandesanugraha murti, Madanantaka. 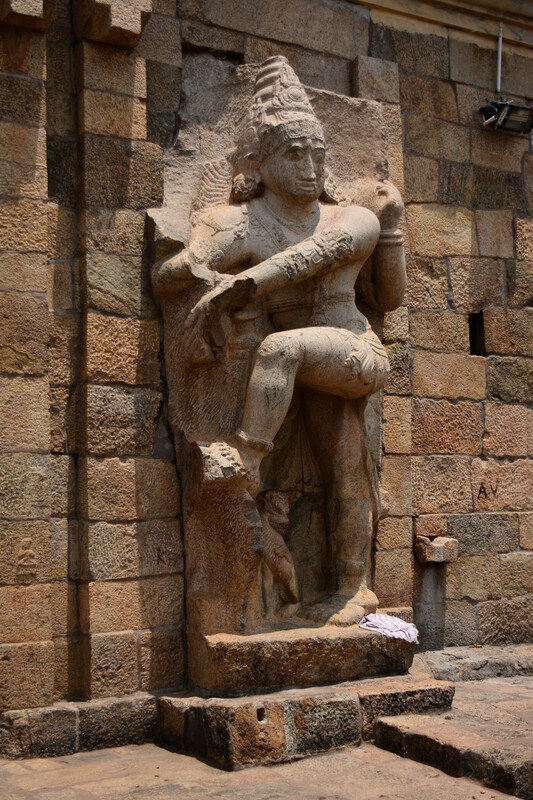 There also exists a large sculpture of Nav-Grahas inside the main Temple. The Temple also has many inscriptions of the land grants, gifts and records by various Chola kings, but none by Rajendra I. The carvings on these walls takes one back in time makes one wonder about the era gone by. I came across sculptures that were beautifully conserved showing no signs of age. Some parts of the Temple are in ruins, due to the damage caused by the English and the French, who used the Temple as a fort in the 18th century. Today the Ponneri reservoir is in name only and only the ruins of the grand palace exist. No matter how you look at it, till this day the Temple at Gangaikondacholapuram eloquently speaks of grand magnificence and the glory days of the great Chola kings. The temple hardly gets any visitors, so you can visit it anytime. If you plan to visit in summer months make sure it is in the mornings or late afternoons as the stone inside and around the temple complex gets very hot. And do note, you can’t wear footwear inside the temple complex.